"Golf Course lot with Stunning Sea and Lake Views"
Style: Lot / Land "Golf Course Lot"
Size: 13,000 sq. 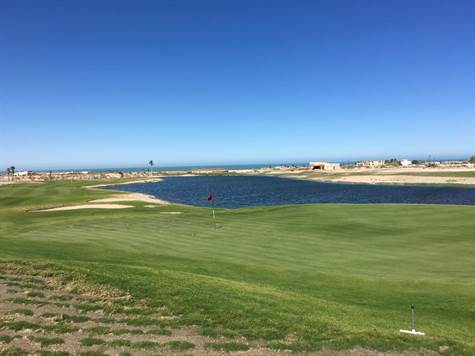 ft. "Golf Course lot City water and Electricity"
Golf Course Lot with Stunning Sea and Lake views in the gated, beach front community of La Ventana Del Mar on the Sea of Cortez in San Felipe, Baja, Mexico. Tap fees for City water and electricity already paid. This over 13,000 sq foot home site is on the 7th fairway with one of the best views in the community. Gated with 24 hour manned security. The community amenities include, swimming pools with water activities, tennis courts, an activity center, 3 restaurants and beach access for residents. HSBC Fideicomiso. Terms available.